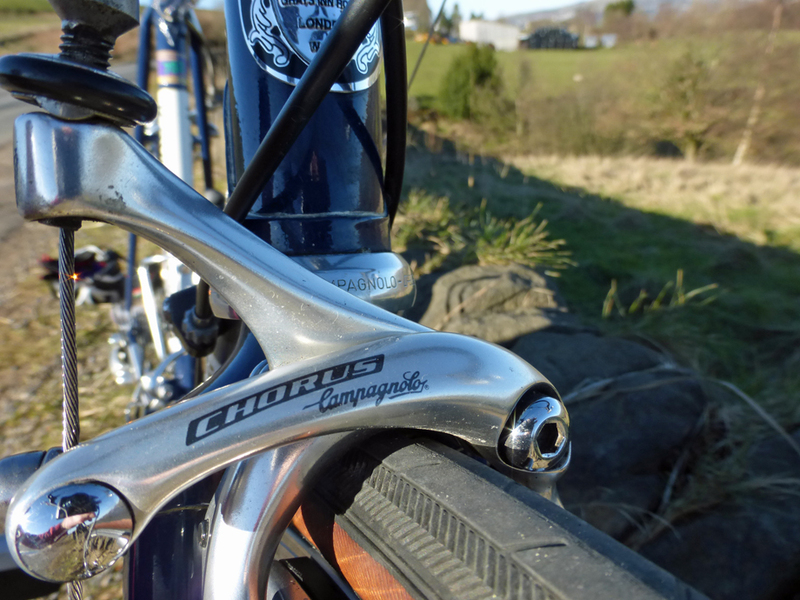 PezCycling News - What's Cool In Road Cycling : Retro Readers’ Rigs: Bull Horned Steely! Retro Readers’ Rigs: Bull Horned Steely! We've had everything from custom carbon, aero wonder superbikes and even museum stunners featured in Readers' Rigs but we've never had a bull horned, custom steel bike until today. Kevin from Lancanshire's unique steel ride certainly qualifies for Readers' Rigs though as he and his machine have a very cool story behind their time together that includes over 25 years of ownership of ups and downs and thousands upon thousands of miles. I started cycling in 1987 aged 27 years. 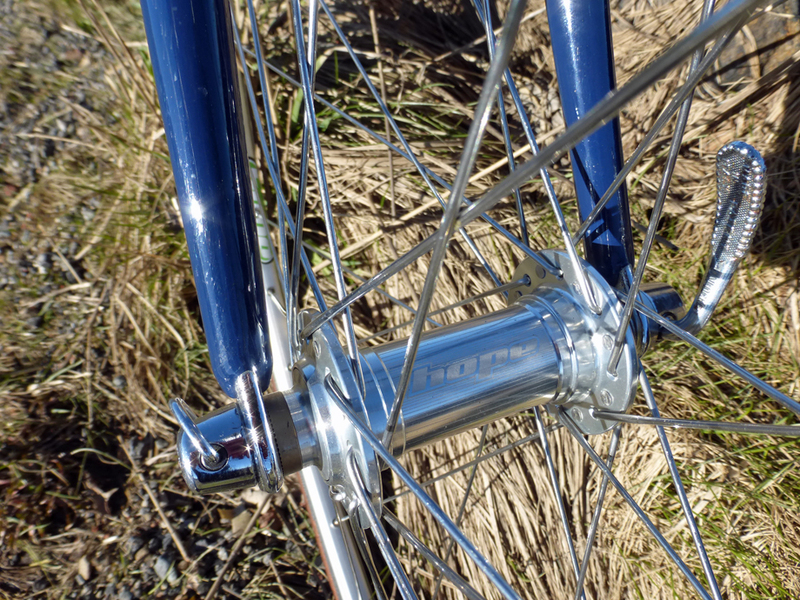 The frame was built out of Reynolds 753 tubing and made to measure in 1991 by Pete Mathews a renowned wheel builder who had a shop in Liverpool. He used to make wheels for Robert Miller and Sean Yates when they rode the Tour de France in the 1990’s. My wife Lesley came into a small inheritance and as she knew I had always wanted a made to measure bike, she gave me some cash which enabled me to fulfil my dream. 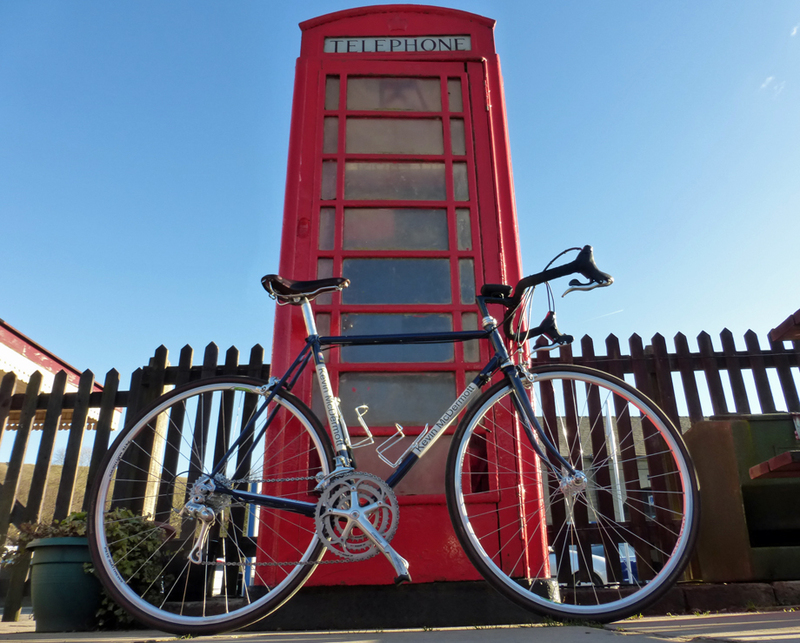 In 1991 a British cycling magazine, Cycling Weekly had an article about the best built Steel frame bike for under £1000 ($1400), which is apparently £2500 or $3500 in today’s money. Pete Mathews the frame and wheel builder from Liverpool was featured. I had managed to save up some more cash and with Lesley’s donation, I went the whole hog and treated myself to a hand built bike by him. Best thing I ever bought! All that is left of the original bike is the frame. From being built in 1991 for many years it was my only bike. I used it regularly to commute the 20 miles each way to work and it never let me down. Unfortunately on New Year’s Day 2012 I had a crash when I hit a pot hole. I hit the deck and the crash snapped the seat tube, trashed the wheels and scratched just about everything else. Luckily I escaped with just bad bruising and bumps. The frame languished in the garage for a couple of years, because I was told the snapped seat tube was unrepairable. I couldn’t part with it so it just hung there in the garage. Then in May 2014 I was diagnosed with Stage IV Skin Cancer. The resulting Operations and treatment kept me off the bike for over 8 months. As therapy I decided to try to restore my broken bike. My good friend Sean Mcadam who runs Ken Fosters Cycle Logic in Manchester, decided to take my broken frame to a frame restorer that he knew. This guy was a genius, he managed to take out the broken seat tube, replace it with matching Reynolds 753 tubing and then he did the respray to my specifications. I decided that I would try and get a traditional 1990’s look with the paint job and then instead of the builders name on the frame I had mine “Kevin McDermott” put on it. The repair is flawless and the paint job exceeded my expectations. The trawl of Ebay and such sites looking for the parts that I needed really helped to keep me focused during my Cancer treatment and time off the bike. The main modification though is the handlebars. After years of playing Rugby I have two depressed vertebra in my neck and I find any length of time on the drops can be painful. My good Friend Sean of Kens Fosters Cyclic Logic Bike shop in Manchester came up with the solution. With his help 14years ago I converted to Bull Horn or Track style bars. The bars are “Profile Design” which Sean picked up from a contact at the Manchester Velodrome after the 2002 Commonwealth Games. The bars had been used by the England Team during the games and were discarded at the end of the games. So they have been on my bike ever since. He managed to sort out the cable routing so everything works fine. Due to the way he had to run the cables they are not hidden on the bars like todays machines but are exposed just like they were on the bikes in the 1990’s “Old School” , so it looks period even with the bull horn bars. It was Sean who built the bike up once I had had it resprayed and located all the new parts. With the original parts trashed in the crash, I scoured Ebay and the internet to find parts from the 1990’s era. It has a Campag Record headset, Campag Chorus brakes, a fabulous Campag Record Triple crankset 53x42x32 which I managed to pick up as New Old Stock for £50 ($70). 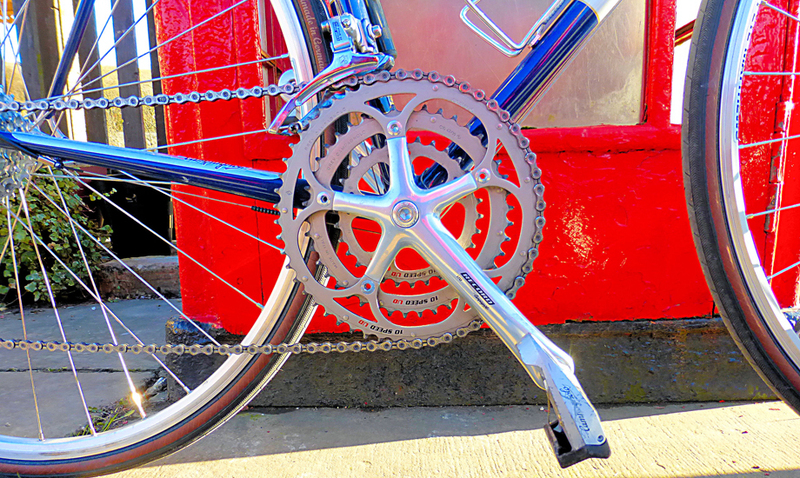 I then have a Campag Comp triple front and rear derailleur matched with a Campag 12x29 rear cassette. 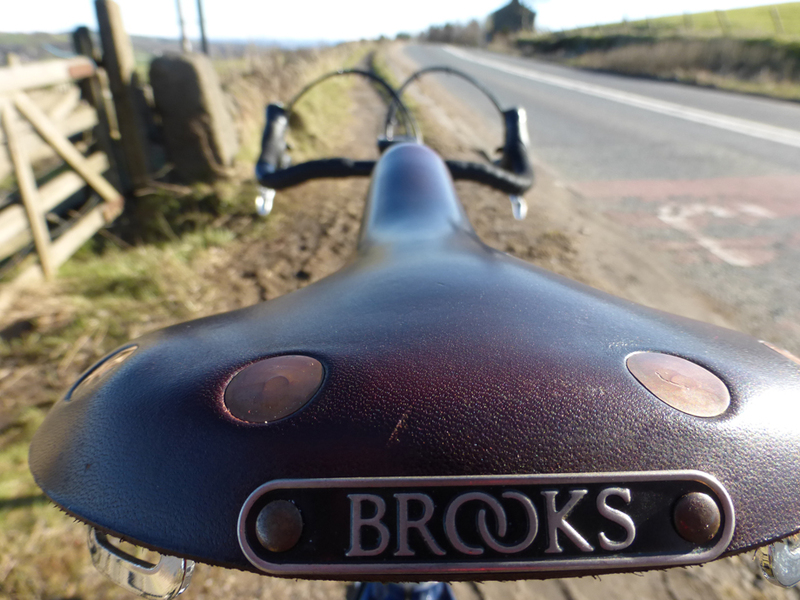 The seat post is Campag and the saddle is a new Brooks Swift. As I mentioned I am running Pianni wheels hand built by Pete Mathews the guy who originally built the bike for me in 1991. There is a little story behind these new wheels. 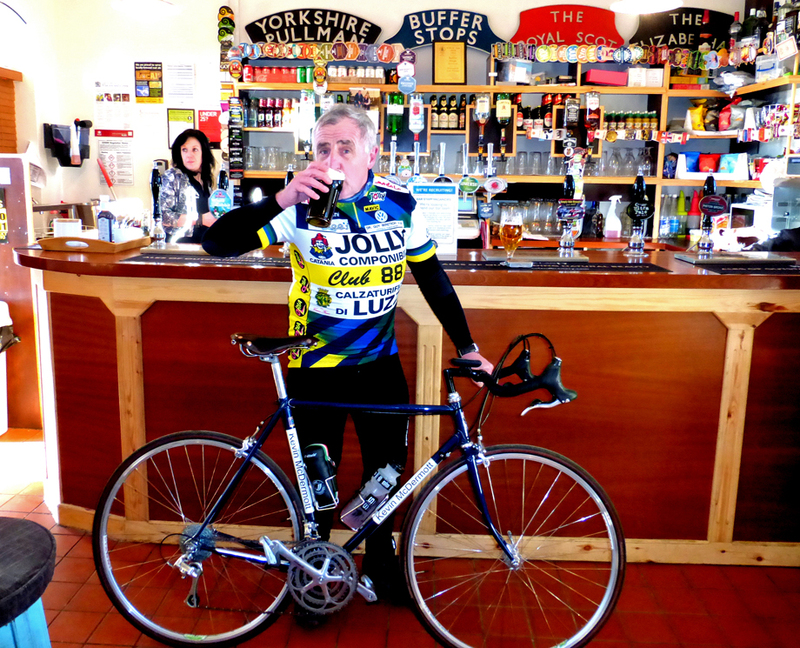 In 2015 when I was going through the process of renovating it I bumped into the very Pete Mathews, who originally built the bike in 1991, on a cycling holiday in Mallorca Spain. He is now 70 years of age and actually remembered me and the bike he built. When I told him I was renovating it he offered to build the new wheels for it. 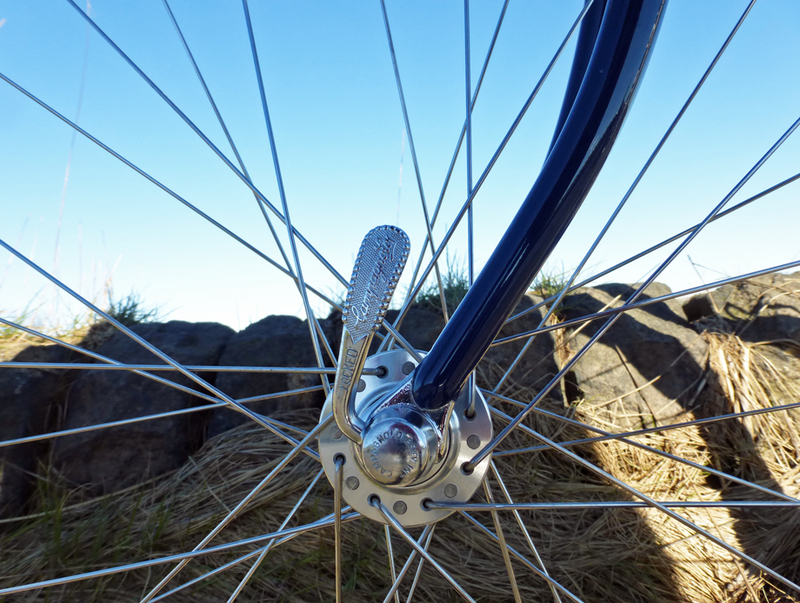 So when we got back to the Uk I drove over to see him in Liverpool and although he has long since sold his shop he still had all the required tools and he built up the wheels on 32 spokes with Hope hubs, they are a true delight. When I was regularly commuting to work I would average 8-10,000 miles a year. Now I am semi-retired I average around 5-6000 miles a year. I reckon this old bike frame has well over 100,000 miles (160,000km) on it, as I previously mentioned that for many years, it was my only bike. With it being made to measure it fits like a glove and as we all know “Steel is Real”. It is comfortable on long rides, the steel really does give a fabulous ride. A steel frame has a ride and character that can only be steel, a certain “Zing” that is hard to explain unless you have ridden one. No bikes in my opinion ride better than a steel bike. I have 3 other bikes a Full Titanium, a Titanium/carbon mix and another 1995 Columbus SLX steel framer. But none really can match the comfort of this machine. It is just a bike I love riding. Although now restored it gets treated like my other bikes ie “IT GETS USED”. Just making sure you wipe it down after every ride and regularly clean it properly they will all look as good as new for a long time. Kevin using his bike.......for a trip to the pub! 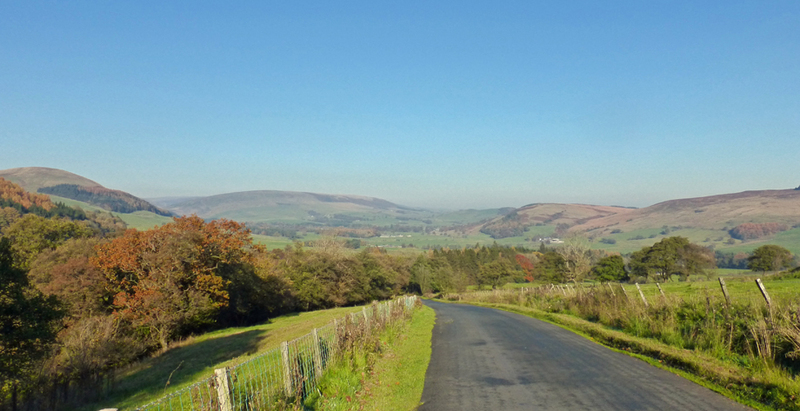 An area called “The Forest of Bowland” which is about 15 miles from where I live. The Tour of Britain came through in 2015, the stage took in some of my favourite places, Whalley, Clitheroe, Downham, Dunsop Bridge. It is a beautiful scenic area of rolling hills, sharp climbs from 4-25% . I do a lot of miles on my own “Billy No Mates Miles” we call them. If not lonely I ride with my Brother in Law or my good friend Sean. However 4 years ago I was in Palm Springs in California I rented a bike and I hooked up with the Palm Springs Cycling Club. On a Saturday I was invited to their weekly club ride. I could not believe it when 80+ riders turned up. I sat near the back of the peloton and got towed round at a dam fine pace for 60 miles. I really got to feel a little of what it must be like for the Pro’s to ride in a massive group and experienced properly how much easier it is being towed along by a big bunch. At present I don’t intend to upgrade anything. But with me running triples on all my bikes and manufacturers reducing or not even producing Triple groupsets, I always scour Ebay to purchase parts to put away for when my current parts wear out. I am not against “Modern” but I will admit to being a “Dinosaur” because I just love “Triples”. I have 4 bikes and all are kitted out with a triple group set, oh and my “Bullhorn” bar set up. Triples are just the best for us noncompetitive cyclist who want to be able to do long rides and take in decent climbs without actually killing ourselves. 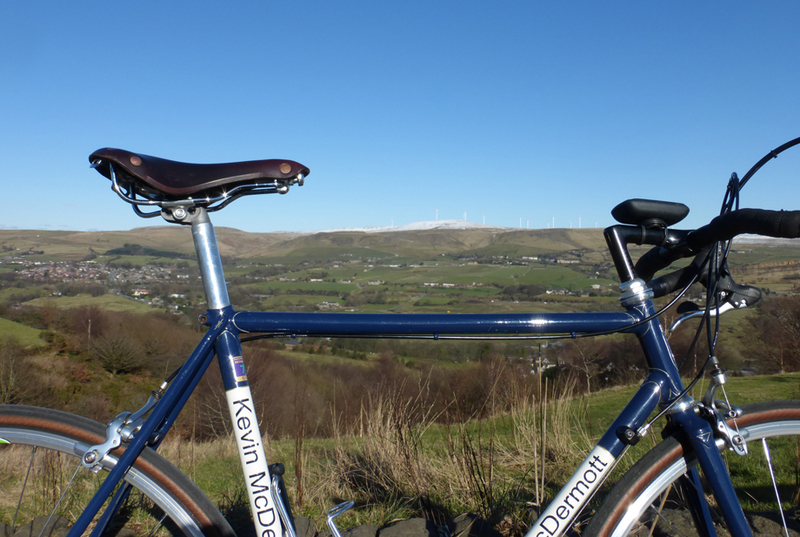 One of my favourite climbs is called “The Nick O’ Pendle. It averages 14% with a 22% ramp for the last 100 meters. If I had a £1 or a $1 for every time I have pedaled past other cyclist still whilst still sat in the saddle twiddling my “Granny Ring” whilst they sway from side to side on their Standard or compact groupsets, grinding out of the saddle to reach the top, I would be a rich man. 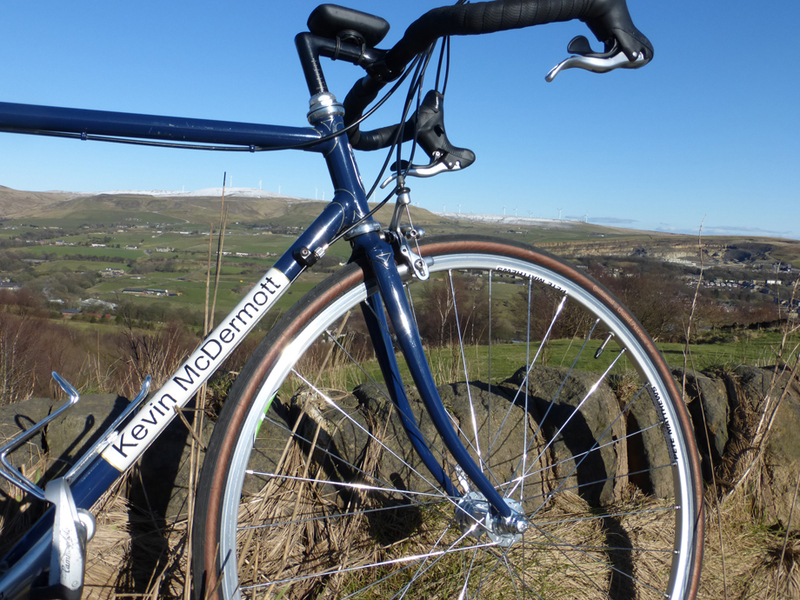 Thanks to Kev for sharing his much loved ride with us. Got a bike that you're proud of? Well how about sharing it with fellow PEZ fans and getting it featured in Readers' Rigs so we can all stare at it! Contact us via the Comment box below, or send us a Readers' Rigs submission direct to [email protected] and your bike could be featured in all its glory here on the pages of PEZ.